A fragment of a fossilised bone thought to be more than 700,000 years old has yielded the genome of an ancient relative of modern-day horses.This pre-dates all previous ancient DNA sequences by more than 500,000 years. 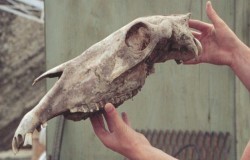 The study in the journal Nature was made possible because the bone was found preserved in Canadian permafrost following the animal's demise. The study also suggested that the ancestor of all equines existed around four million years ago. A remnant of the long bone of an ancient horse was recovered from the Thistle Creek site, located in the west-central Yukon Territory of Canada.Palaeontologists estimated that the horse had last roamed the region sometime between a half to three-quarters of a million years ago. An initial analysis of the bone showed that despite previous periods of thawing during inter-glacial warm periods, it still harboured biological materials - connective tissue and blood-clotting proteins that are normally absent from this type of ancient material. The multi-national team of researchers pulverised a fragment of the bone to recover its DNA, then subjected it to high-throughput, next-generation gene sequencing to unravel the blueprint of this antediluvian mount. The first approach they tried resulted in relatively poor yields of horse-derived sequences, so they turned to a technology that could directly analyse single molecules of DNA. This proved far more successful - but they still had an abundance of data to plough through. Using high-powered computers and an existing horse genome sequence as a reference, the scientists sifted through the 12 billion sequencing reads to distinguish between DNA motifs belonging to the ancient horse and those from contaminating organisms, such as bacteria accumulated from the environment.